A large (14x4x1,5cm) Epipaleolithic blade from Maroc. The Epipaleolithic of theMaghreb is spanning the time from the LGM about 20 k.a. BP until the Holocene. During this time span both temperate and wet climates, but also hyperarid conditions were present and men successfully coped with them. If settlement systems were stable over the whole period is somewhat unclear. The exact time of the earliest occurrence of an Upper Paleolithic of the region is a matter of debate. At the Grotto d´Ifri n`Ammar, in the Moroccan Rif mountains, there are indications for an early upper Paleolithic before the Iberomaurusian (20 ka-10 k.a. BP), which has not been dated yet. Genetic evidence suggests that there may have been population exchange between the Maghreb, Cyrenaica, and the Levant during or before the LGM. This has led to the idea that the Iberomaurusian culture spread from the Near East. However, the Iberomaurusian at Tamar Hat (Algeria) and Taforalt (eastern Morocco) predates its appearance at Haua Fteah (Libya). More research is needed into the period immediately before the appearance of the Iberomaurusian across North Africa. A number of lithic tools ( backed bladelets, segments) are in many ways very similar between the Iberomaurusian and the Capsian (10-7 k.a. BP). This has led some (Lubell 1995) to speculate that there is a strong continuity between the two industries. In general geometrics increase from the Iberomaurusian to the Capsian. Tixier’s (1963) typology of the Epipaleolithic wisely does not seek for “Fossil directeurs” of either the Iberomaurusian or the Capsian but gives an exact description about the wealth and variety of artifact types, which clearly exceed the complexicity of the late European Paleolithic. Large backed or semi-apruptly retouched blades, like the example displayed here, are more common during the typical Capsian. Anyhow the inverse retouche of this artifact is a rare feature. During the Iberomaurusian blanks were detached from small single platform cores. 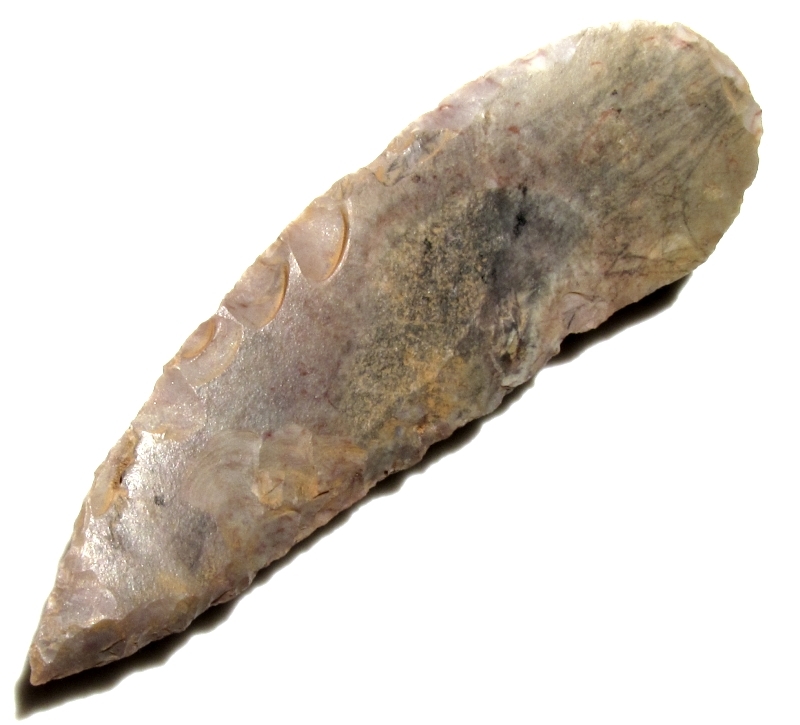 Although there are some larger artifacts (> 10 cm), most tools are made from bladelets. Most of these microliths are backed bladelets. Some segments are also present. There are some thumbnail scrapers and burins. Geometric microliths are present but rather uncommon. Most implements would have been used in composite tools. The Capsian beginns during the arid younger Dryas and is traditionally divided into two horizons, the typical Capsian and the upper Capsian which are sometimes found in chronostratigraphic sequence. Some authors suggest that a time overlap of these entities may also be possible. The typical Capsian is characterized by a significant blade based component (burins (ca. 25%), endscrapers (ca. 20%), and large backed tools). Backed bladelets are present in quantities of about 10-20%. Geometric microliths comprise about 10% of the outillage. The Upper Capsian is characterized by abundant and varied geometric microliths and numerous forms of backed bladelets. Burins are fewer than during the typical Caspian, but there is much regional variability. How Epipaleolithic ensembles refer to specific activities, ecological factors, site structure, style and culture, duration of stay and raw materials is still a matter of debates. There is a clear need for much more stratigraphic sequences, excavated with modern methods over the whole area.